Hello. 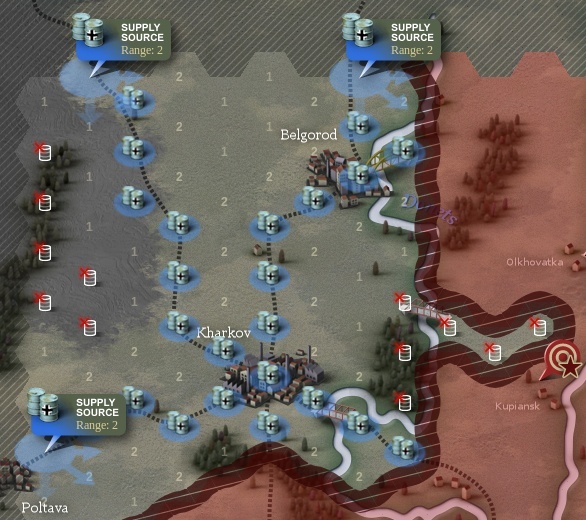 It’s been a while, but we’re back in business with spilling the beans on various aspects of Unity of Command. I’ll do my best to explain how supply works today, since this seems to be both the most intriguing and most confusing element of the game. OK, I’m not being very original here, but it’s an old and slightly worn-out saying that is nevertheless true. Guns need ammo, tanks need fuel. Soldiers need food and horses need fodder. If your units are not in supply they become weak and are easily picked off by the enemy because they can’t defend and they can’t run away. Here is how it works in the game. Your units receive supplies once at the start of each turn, but only if they are in a supplied hex location. If not, they are considered out of supply for the turn, and the adverse effects start to kick in. We’ll get into details of which hex is supplied and which is not later when we discuss how the supply network works, but first let’s see what happens to a unit when it’s out of supply and what are the effects precisely. On the left side of the image is the unit just before it is cut off from supply. It’s a reasonably combat ready unit, with four active steps and one suppressed. Going from left to right you can then see the effects when the unit is out of supply for 1, 2 and 3+ turns respectively. On first turn, the only effect is that the suppressed step hasn’t recovered like it normally would. The red exclamation mark is there as a warning, but the effects are not too harsh – which is just right because units would normally have supplies on-hand for a few days of fighting. Second turn effects are harsher: two steps are suppressed and the unit is without its Action Point, meaning it cannot attack. The exclamation mark gets bigger still. Then, after 3+ turns out-of-supply, the unit is completely suppressed and it’s also partly immobilized because it doesn’t even get it’s full Movement Points for the turn. Note that the unit is not KIA at any time during this. If you can get it safely back into supply it will recover to full strength over a few turns. But when it’s vulnerable like that it can be easily picked off by enemy units, which is/was a common strategy. If you play Unity of Command, you will be thinking about this a lot. Keeping your supply network running is the other part of this equation. This is so important that there is special map view in which the units are hidden so you can inspect your supply arrangements. Let’s check out an example. The enemy territory is in red and is obviously not supplied. Unsupplied hexes within your own territory are marked with a white barrel with a red X on it. If your unit starts the turn on one of these it will be unsupplied for that turn. All other hexes within your territory are supplied. Supplies enter at edge-of-map supply sources, and from there they travel along rail lines as long as there is an uninterruped rail connection. Then, as supply works its way into the field, range starts to count. This is handled much in the same way as unit movement, where the cost of travel in each hex depends on both terrain and weather. The effects of this can be seen on the eastern end of the example map. Because moving supplies is more difficult in the mud, the reach of supply network is shorter in the muddy area there. There’s another unsupplied area to the west, but in that case it’s a classic situation of advancing units simply outrunning their supply. Well, no, not much. Sure, there are the little twists as usual: experienced units fare better when cut off, and are quicker to recover. And tracing supply works almost, but not exactly, the same as tracing movement. But I’ll leave those details to the manual, as they’re probably too arcane to explain at this point, before you can get your hands on the game. Anyway, I’m signing off. It’s more than enough to digest in a single post I think. For the next one, I’m taking requests, so if there’s a feature of the game system that interests you in particular, drop a note in the comments and I’ll see what I can do.